How to plan unstructured time for children. Sometimes the world seems upside-down when it comes to defining a “normal” childhood. That was a constant struggle for Sharon, a working mom who came to talk to me about her 6-year-old son Will. Sharon noticed my puzzled look. Here was a caring and relaxed mother who was giving her active 1st grader free time to roam, discover, socialize and use his imagination, and she was beating herself up about it! Yet, Will was doing some of the same things Sharon loved to do as a child. She could recall many days spent running through her yard and riding her bike around town. This is not unusual. Many parents with concerns about their children’s use of time end up recalling nostalgic images of their own childhoods: wandering the neighborhood, gathering in the backyard with friends, retreating to the attic to make up stories and plays. However, many parents retell these memories with resignation in their voices. Though it may seem nice to briefly pause to consider the good old days, ultimately we feel we have to get down to business and get our kids signed up for their sports, programs, lessons, tutoring sessions and classes. Unlike most of children’s experiences, free play entices kids to feel that they possess the ability to control their fate. Free play empowers kids to develop mastery over their immediate environment, in a way that organized activities cannot match. Through play, kids have the chance to test theories, problem solve, create personal narratives and act out who they want to be. In studies, imaginative play is linked to increased patience, flexibility, impulse control, resilience and coping skills. Many social benefits linked to free play are easy to understand. It is fun and interactive, and allows children to assume multiple roles and build on each other’s ideas. Don’t fear boredom. Encourage exploring by giving play equal billing with other activities. The most important thing kids need when learning to pretend is time. If they get caught up in scheduled activities or get hooked on TV and video games, they may not really learn to play on their own or develop their imaginations. They may also complain that play is “boring” when they have nothing on their schedule. Parents can learn to rebut these protests, if they recognize that there is value in free play and understand that creativity often emerges when kids have no other choice but to create their own games. Set the stage for play. In addition to setting aside time for play, parents should provide material and space for kids to let themselves go. 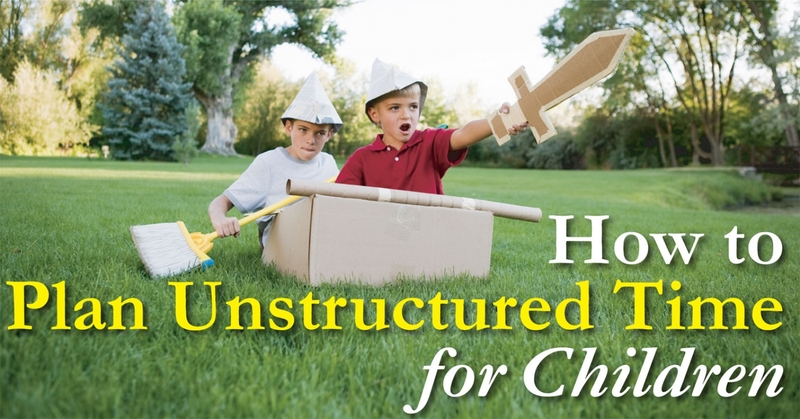 Unstructured toys like blocks, dress-up clothes and Legos that promote creative thinking are ideal props for stimulating imaginative play. For some children, especially children who are less drawn to creative play, action figures, constructed forts and toy castles often inspire a stirring scene. Having paints, crayons and paper available lets kids record their adventures. Tell stories. Inventing stories with our children about dashing adventurers, witches in the dark forest and brave pioneers can also stimulate their imaginations. Though stories may emerge from fairy tales, it is often more exciting to make up original narratives and have children help in adding personal details. Added embellishments need not be fancy or dramatic; little kids appreciate just about any of their parents’ story-telling attempts. Model playfulness. Children love to see their parents have fun. Playing games, telling silly stories, dancing and just goofing around evoke laughter from children. Life can seem so serious. Kids need to see that adults have not forgotten how to enjoy themselves and how to have a sense of humor. When parents value playfulness, fantasy games, stories and creativity continue to seem important. Besides, kids are likely to use humor and creativity to look on the bright side of situations if they understand their parents value a good time and a good attitude. Choose organized activities wisely. For children under age 7 or 8, one or two activities a week is usually more than enough. Leave enough time for play and be aware that too many classes and games may stress children. Little ones may try an instrument or take swimming lessons, but it is wise to limit the total number of structured activities that children tackle. Perhaps advise your youngsters, “You can each choose one activity this winter.” Remember, children don’t have to do everything at once. There is time. When choosing sports, be careful to find leagues that are not too competitive and instead emphasize fun, education, sportsmanship, rule comprehension and basic skills. Heed nature’s call. While children are young, give them time to enjoy being outdoors in the “wild.” No other setting provides that freedom-inducing experience of the open world. In nature, children can learn to relax, observe their surroundings, think creatively, and run and play endlessly. Think of the memories you cherish from childhood. Did you enjoy searching for frogs at the pond, catching fireflies, learning to jump rope and climbing trees? Our children have their whole lives to join teams, take lessons and be supervised by adults. However, they will never have the chance to relish the outdoors quite in the same way. About the author Paul J. Donahue, Ph.D.
Paul J. Donahue, Ph.D., is a nationally recognized clinical psychologist and founder of Child Development Associates in Scarsdale, New York. He is the author of the recent book Parenting Without Fear: Letting Go of Worry & Focusing on What Really Matters (St. Martin’s Press/Griffin Original Paperback) and the co-author of Mental Health Consultation in Early Childhood (Brookes Publishing Company). Visit www.drpauldonahue.com for more information.